Yesterday I talked to Aconex‘s Dexter Bachelder (VP Americas) and Frank Carron (VP marketing) about a major deal that, for me, is a landmark in the adoption of web-based construction collaboration technologies. 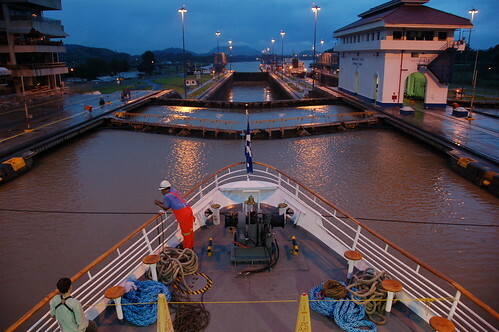 Australia-based vendor Aconex announced yesterday (see news release) that it had been selected to provide collaboration support services to the US$3.2 billion Panama Canal Third Set of Locks Project. This mega-project is the latest in a series of major international schemes upon which Aconex has been appointed; it underlines that the company is now a major player in global infrastructure projects. Perhaps most crucially of all, though, it underlines that Software-as-a-Service (SaaS)-based collaboration platforms, not internally-hosted applications, have an increasingly central role to play in promoting collaboration and information-sharing across geographically dispersed, multi-company, multi-disciplinary teams. The new set of locks, at the heart of the $5.25 billion expansion of the Panama Canal, will allow the waterway to double its shipping capacity by 2025. The project involves the construction of two new lock complexes – one on the Pacific and one on the Atlantic side of the Canal – that will be 40 percent longer and 60 percent wider than the originals. Each lock will have three chambers and each chamber will have three water recycling basins. The expansion program is scheduled for completion in 2014, 100 years after the canal first opened. Frank pointed out that the Panama Canal Expansion project was not Aconex’s only mega-project. “We have started to work hard, sometimes for months on end, to target strategic international schemes. These also give us big reference projects for major players in the US market.” He cites recent wins to provide collaboration services for the US$6bn RTD Denver FasTracks project and Italy’s US$7.2bn Strait of Messina Bridge project (which includes some companies also involved on the Canal project) as examples of their success. Aconex is not only supplying software – and the usual configuration, training, consultancy and support services – to the project; it is also supplying some manpower. Dexter told me that Aconex will be deploying two Aconex employees to work on the project’s document control. “Worldwide, we now have 35-40 people that we can bring into projects to work as document controllers, usually for the start-up phase, but we find that some customers, particularly on the bigger projects, want a permanent presence” (I may cover this service in another blog post in due course). Good collaboration between the different consortia and joint ventures designing, constructing and project managing the Canal expansion project would not be possible unless there was one application that helped draw all the project’s team together, Dexter argued. Rival bidders for the project had promoted alternative systems, often internally hosted, but the successful team had opted to use Aconex as an interface across the project team. “We will provide integration with Microsoft SharePoint and with Oracle Primavera P6,” Dexter said. Aconex’s international experience has already seen its application delivered in different languages, and the Panama project will be no different. The platform will be available in English, Spanish and other languages. Aconex’s international network of offices will also be brought into play to provide local training and support to team members based in different countries. consultants or contractors as they expanded into neighbouring markets. For example, UK players such as BIW and Asite opened operations in the Middle East (and suffered when the Dubai market slumped). More recently, 4Projects and BIW have joined Aconex in specifically targeting the north American market (post). However, Aconex took a different tack once it moved outside Australasia in the early 2000s, starting up small, satellite operations – often little more than one or two people – in numerous countries. These ‘beach-heads’ gave the company exposure to a wider range of potential industry customers – invaluable when some of these customers have joined together to work on mega-projects such as the Panama Canal expansion. This international expansion also, I think, informed Aconex’s software development. I debated this with Frank and Dexter, who agreed that the leading UK vendors have really pushed the boundaries of collaboration away from a focus on document collaboration towards integration with process management (workflow) and compliance. Individually, document-sharing, cost control and project management are still strengths of rival products, but few have the all-round capabilities of platforms developed and deployed in the demanding UK construction market and in overseas markets which share its complexities. Update (31 August 2010) – Dexter talks in more detail about some of these issues in an AECbytes Viewpoint article. Given the recent press releases concerning the $1.6Bn dispute on this scheme it would be interesting to have an update on what benefits the use of Aconex has bought to the project. Such complex schemes surely require adequate project controls ahead of file sharing solutions to ensure such outcomes are avoided.